Chief Minister Chandrababu Naidu to inaugurate Thotapalli barrage project in Vizianagaram district on Thursday. It took 12 years to complete the project after Chandrababu laid the foundation to the project in 2003 and sanctioned Rs 450 crore. However, the project was shelved in subsequent years. After Chandrababu came to power, he directed officials to complete the pending works of Thotapalli project on war-footing basis.Naidu would release water for farmlands through right canal for providing water to 50,000 acres. About 1.2 lakh farmlands in 17 mandals in Srikakulam and Vizianagaram districts are to get water from Thotapalli project. The project was envisaged to irrigate an additional ayacut of 1.35 lakh acre besides stabilising 64,000 acre ayacut in Vizianagaram and Srikakulam districts. However, water will be released into the right canal to supply irrigation water to only 50,000 acre ayacut. The water to the remaining 85,000 acre will be supplied in a phased manner. The irrigation facility is already being provided to about 64,000 acre through the left canal of the project for the past few years now. During his second tenure as the Chief Minister, Chandrababu Naidu has envisaged the Thotapalli irrigation project on River Nagavali at Ullibhadra village in Garugubilli mandal in 2003. It was proposed to be constructed at a cost of `450 crore within five years, for irrigating about 1.2 lakh acre of additional ayacut. But thereafter, the project got delayed due to several bottlenecks including stiff opposition from farmers when the district administration started acquisition of over 1,100 acre, followed by issues related to relief and rehabilitation scheme. When the Telugu Desam Party returned to power in 2014, the project came to the fore once again and it was decided to increase the additional ayacut area from 1.2 lakh acre to 1.35 lakh acre for its speedy completion. As a result, the project cost also escalated to `775 crore. With a catchment area of 4,455 sq.km, the State plans to bring 16 tmc of water into usage through the project. 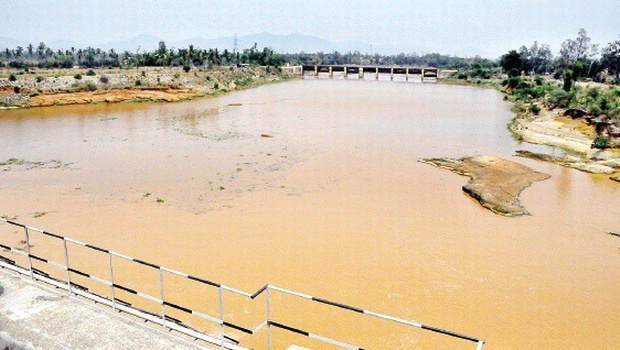 The irrigation authorities executed majority of works including construction of 115 km of the 117 km-long right main canal and readied it for inauguration in the last week of July, but due to breaching of the aqueduct at Lakshmipuram, the ceremony was postponed and the authorities have rebuilt it on a war-footing basis. Another 2-km-long canal was left out as it required clearance from Railways. Of the total `775 crore, works amounting to `568.17 crore have been completed. The works on link channels including 29 distributary canals, four branch canals and two National Highway crossing are yet to be completed at a few places. Hence, water will be initially released to 50,000 acre in both the districts. The officials have successfully conducted the trial runs over the last one week. Rural Development minister Kimidi Mrunalini said the project would benefit farmers in the Vizianagaram and Srikakulam districts who are suffering from water scarcity during peak cropping season. She stated that water would be released to 1.80 lakh acres to the districts by next kharif season.